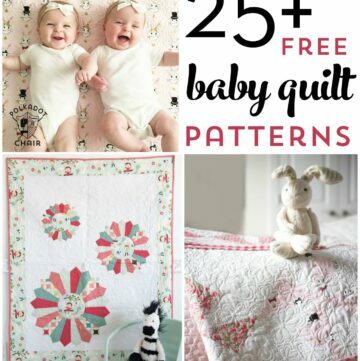 If you’re looking for a special gift to sew for a new baby you may like this tutorial for a simple baby quilt and dress made from fat quarters! 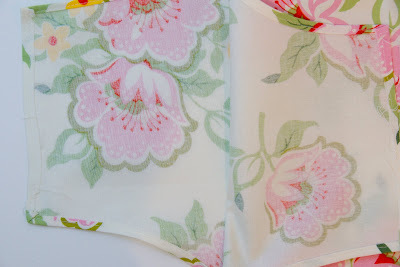 I have been buying more fat quarters than yardage lately, which is economical yet sometimes doesn’t give me enough fabric to complete a project so I have to get a bit “creative” with the use of them. Which by the way, has lead to some of my favorite projects. 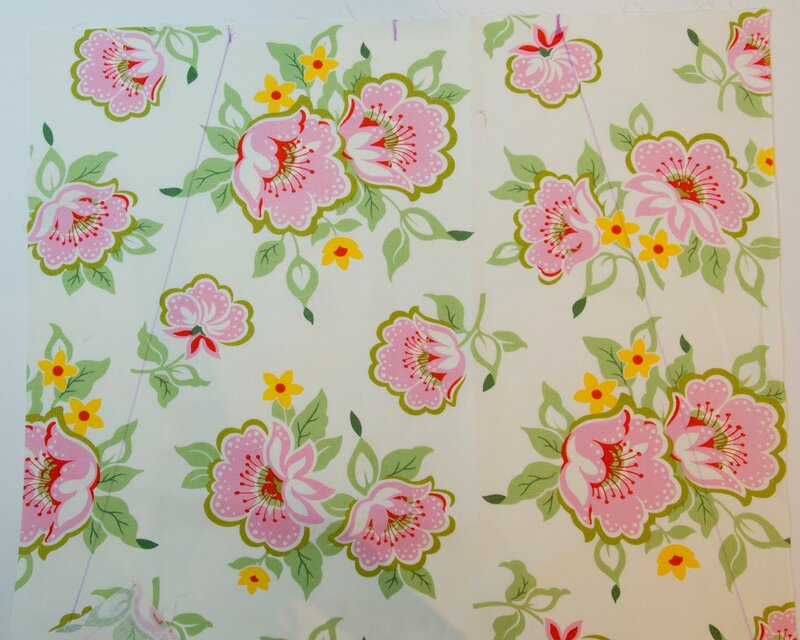 (and why most of my sewing patterns can be made using fat quarters). 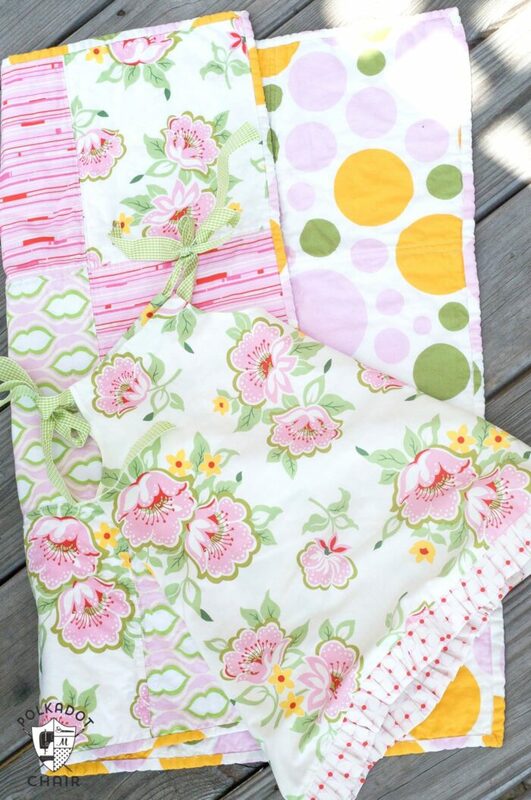 This little baby gift is made from 6 fat quarters and 1 yard of fabric (for the backing). 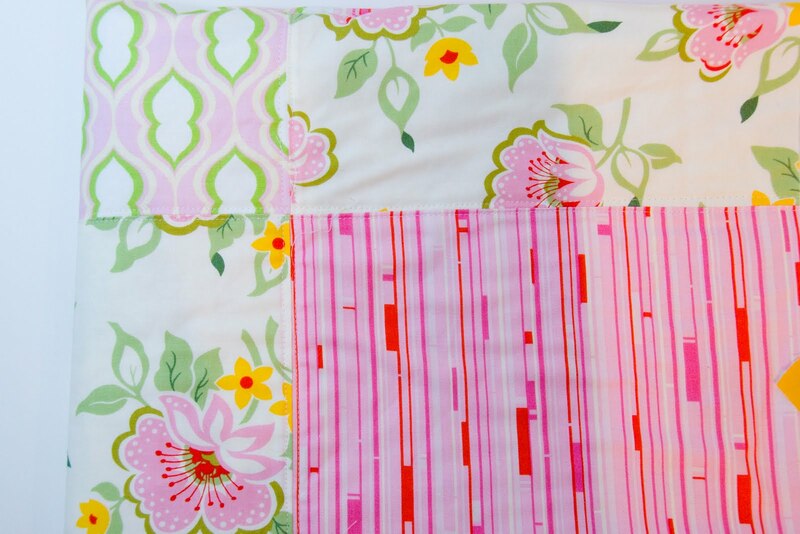 It’s a little pillowcase dress & stroller size quilt (it’s small about 30×30 finished). 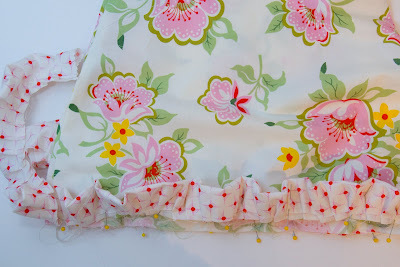 There are enough scraps left from the fat quarters that you could decorate a couple of burp cloths to match if you like, or maybe make a little matching hair bow? I wanted to make a baby pillowcase dress, I’ve seen them around a lot and figured I could just “google it” and a bunch of tutorials would show up… … but after googling I could not find one… so I thought I’d just give it a try based on an dress made from an ACTUAL pillowcase that I did for my daughter. (she is 9… this one is for a baby though). My guess is this is sized about 6 months. (based on garment sizing charts, I don’t know a 6 month old to try it on). I really like the way it came out… but I want to do a few things differently next time.. so I think I’ll do a little series here this summer on pillowcase dresses… this one being the first. If you have one on your blog or know of a good link, send it too me, I’ll do a “summary” post at the end and link up everyone’s dress along with the ones that I made!! (I’m sure there are a bunch of pillowcase dress tutorials in cyberspace, I just didn’t find them). Cut each fat quarter to 18″x18″. Find the center of the fat quarter and mark it. Measure out 4 ” from each side of the center and place another mark. Using a straight edge draw a line from the bottom corner of each side to the marks you made. Cut off the fabric. You will have a trapezoid shape that is 18″ at the bottom and 8″ at the top. Do this for both the front and the back pieces. Place an embroidery hoop over the top corner of the dress. You will be measuring in about 1″ and down about 5″. Trace the curve. Cut. Do this for both the front and the back pieces. 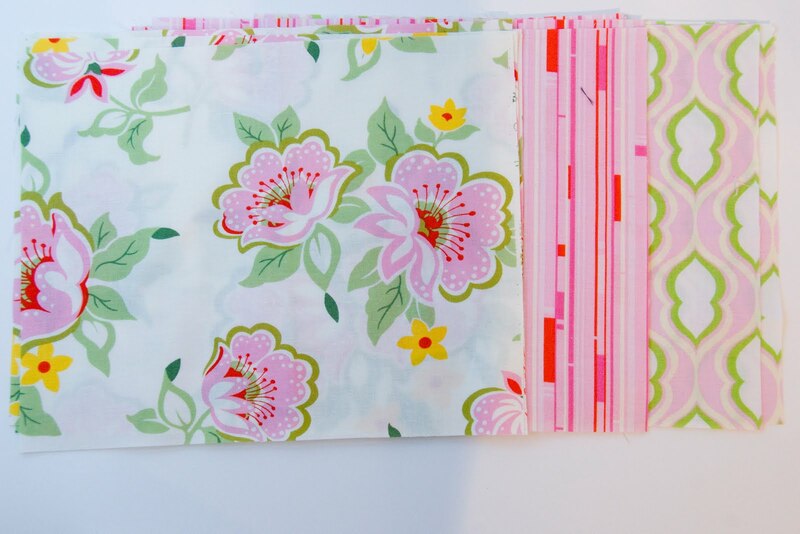 Cut 4 strips each 3″ wide x 22″ long from another fat quarter. Fold in half lengthwise and gather with either a gathering foot on your machine or by running a basting stitch along the entire raw edge. 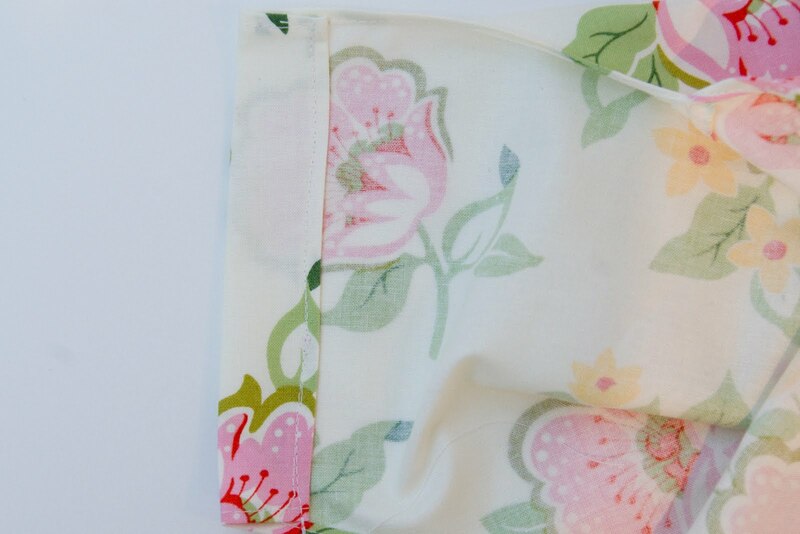 Sew the dress front and back together at side seams. Serge or zigzag the seam. Press open. Pin the ruffle to the bottom of the dress with raw edges together. Stitch to attach. Press seam towards dress, and top stitch right above ruffle. Turn under under arm seams 1/8″, turn under again 1/4″. Stitch to hem. Turn under top of dress 1/4″ and stitch. Press. Turn under top edge of dress another 1″ and press. Stitch in place to make a casing for your ribbon. Feed ribbon through the front and back pieces. 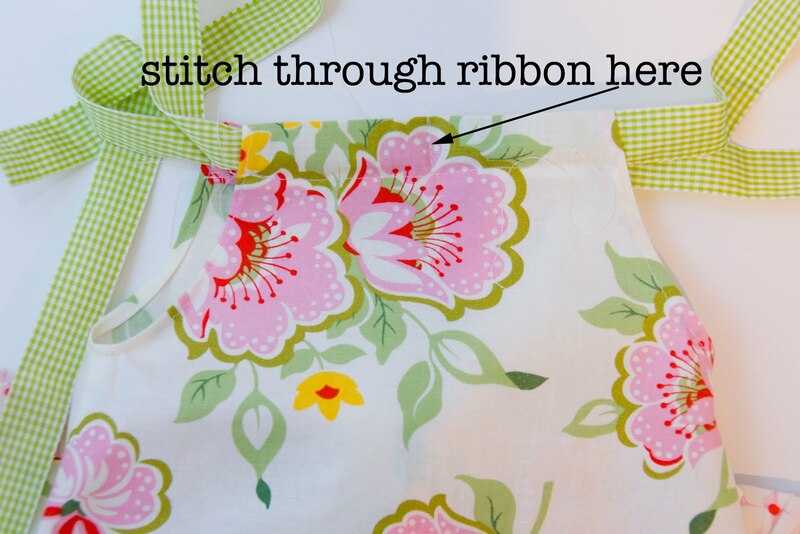 Since ribbon poses a chocking hazard for babies, stitch through dress and ribbon in the center of the dress front and back. This will make it so the baby can’t pull the ribbon off the dress and choke on it. (although since this dress has a tie around the neck, I would not lay a baby down while wearing it). Originally I wanted to make the blocks each 9″x 11″ (a fat quarter cut in 4 pieces) however I realized that some of them were not a true 18″x22″ and the selvage edges were getting in the way. So I ended up cutting them each 8″x10″. You will get 4 blocks from each fat quarter. 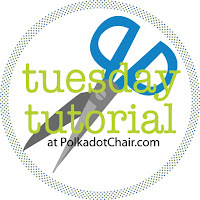 Cut your 1 yard piece to 32″ x 34″. Use the extra from the long (selvage) side as your binding. Cut it to 2″ long, you will need 130″ total. Press seams to one side, press the seams on the odd rows to the right and the even rows to the left. 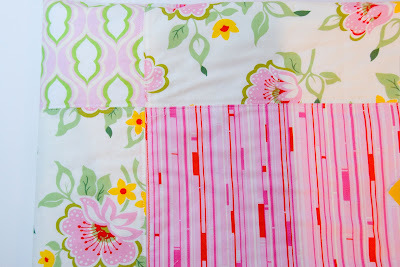 If you want the quilt to be bigger just use more fat quarters and keep repeating the same pattern. Sew rows 1, 2, 3 & 4 together. Press seams. Make your quilt “sandwich” and quilt. I quilted mine with a walking foot. I stitched 1/4″ on each side of each seam. (tried to show a close up of it here). How incredibly adorable! 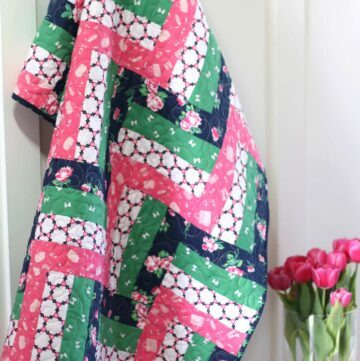 I love, love, LOVE the Nicey Jane line and am so happy to see some more project ideas using that fabric. 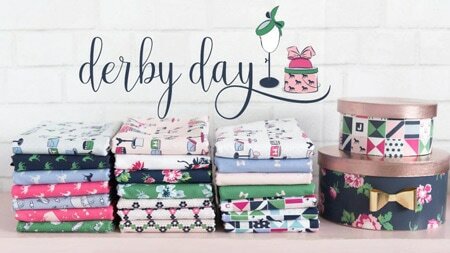 I hope you don’t mind my little plug here, but Crafty Girls Workshop has several of the fabrics in the Nicey Jane line that would be perfect made into the dress or the quilt! And we even have the option to purchase just a fat quarter cut! What a cute idea. Thanks for sharing this! When I make pillow case dress, I make a rectangle(some where around 1.75 & 2 ratio) and cut a “J” shape for the arms. I have also used bias tape for the arm holes to be a littl heavier duty. So fun, Melissa. 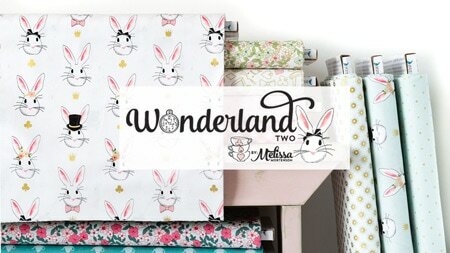 I have just discovered fat quarters, myself. I’m excited to do something like this soon. This is adorable! 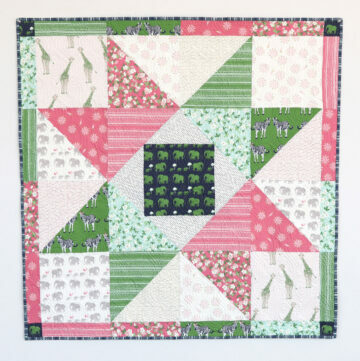 Lately I’ve been into 10 inch squares, but this is making me want to buy some fat quarters next! I love this! My daughter is almost 6 months. I will definitely be trying this out and I’ll let you know about the sizing. Too cute! I have been collecting pillowcases for when she gets bigger. I’m so glad that I don’t have to wait! You can download the dress pattern from Nancys Notions. It is called “Little Dresses for Africa”. I have made over a dozen in various sizes to be sent to Africa. This is a nonprofit organization that asks people to make pillowcase dresses for African girls. There’s a pattern on the website if you ever need one! Love it!! Just love it! Thanks again for such a simple, but great idea. I have lots of this fabric without a project, but not anymore! Enjoy the day! 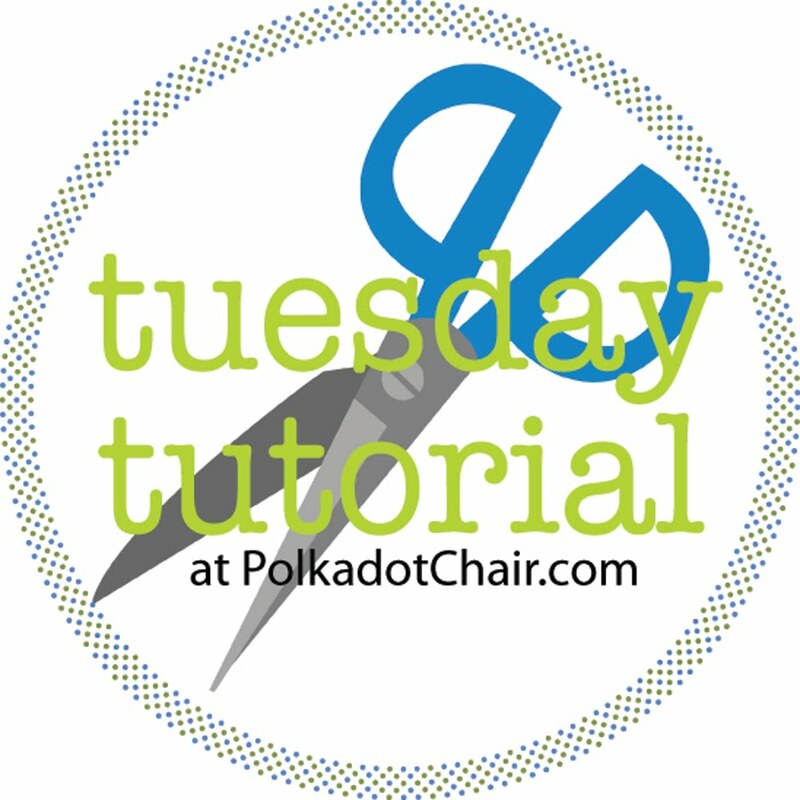 Just a tip … for the stroller blanket … if you attach a ribbon loop to the side or make a large buttonhole near the center, it can be attached to the stroller. I always hated trying to keep my babies’ blankets up off of the floor! Sooo beautiful! I love the fabric you used! 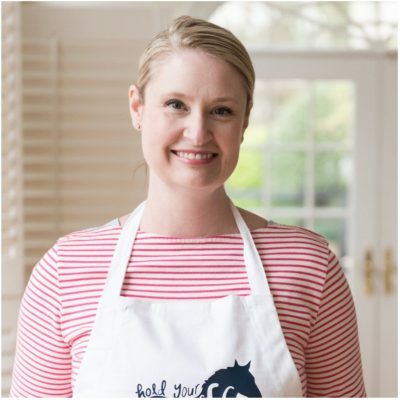 there is a great pattern on froglegsandpigtails.com. wonderful pattern for kids and mom. check out my blog for lots of free tutorials. 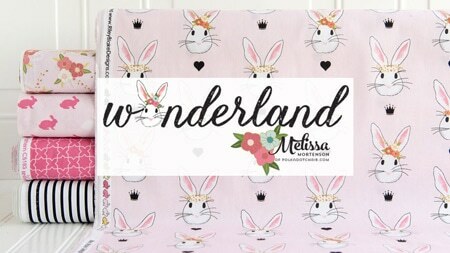 Melissa, this is adorable! 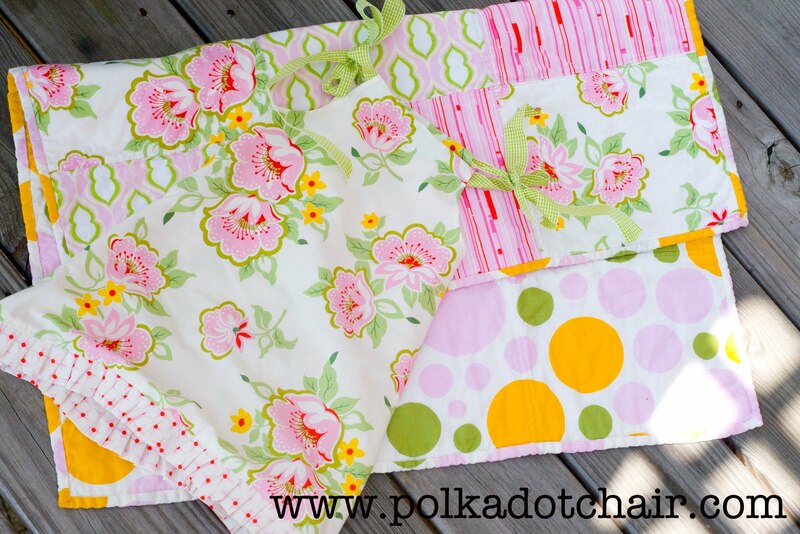 I actually made a pillowcase using these same 2 focus fabrics over the weekend. My mother in law was here and showed my how to do a crocheted edging around it. It turned out really cute. I’ll have to post a pic soon. Again, great job! This is so cute! I am definitely obsessed with fat quarters, so these projects are for me. I actually just bought 10 new fat quarters on Tuesday. I love them. Thanks for sharing! Great little tutorial! I love the fabrics you used, too! I wanted to send you my link for a simple pillowcase dress I have on my blog. 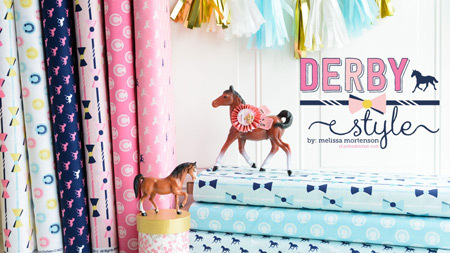 I posted a video tutorial and I also sell the print version of my pattern and step-by-step tutorial for $3. 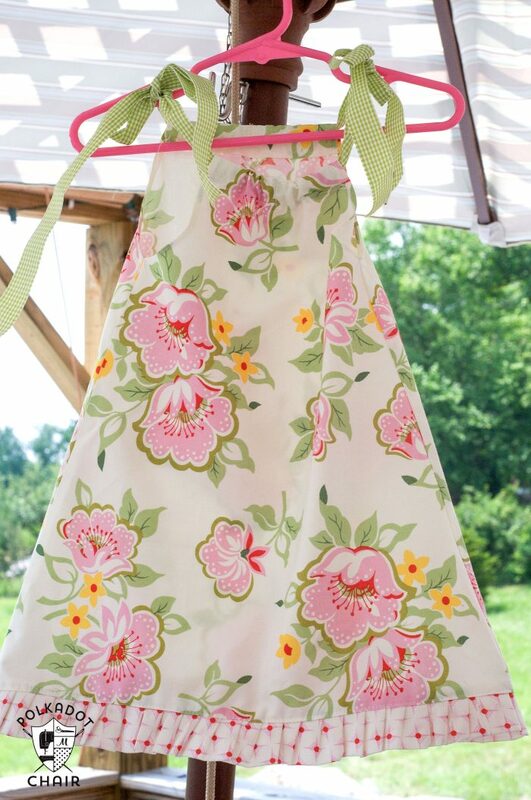 So sweet and simple…I think I may have to enlarge the summer dress for my four year old! Very cute! I love the dress/blanket combo as a gift idea!! Can’t wait to see your bow tute!! I love the dress! So perfect for summer. 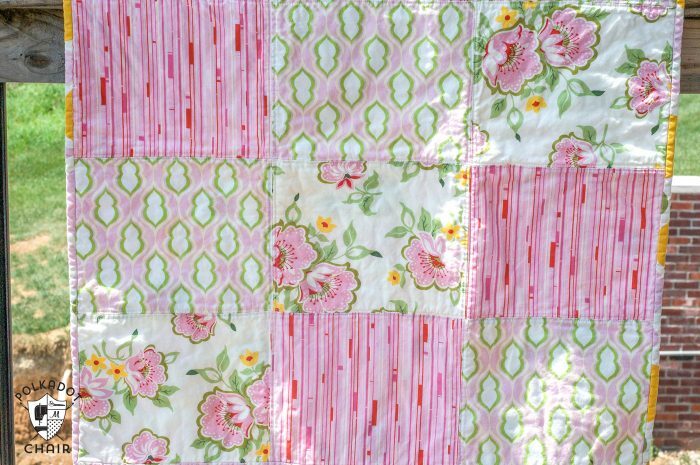 And the quilt is darling. Those fabrics and colors are a wonderful color combination. 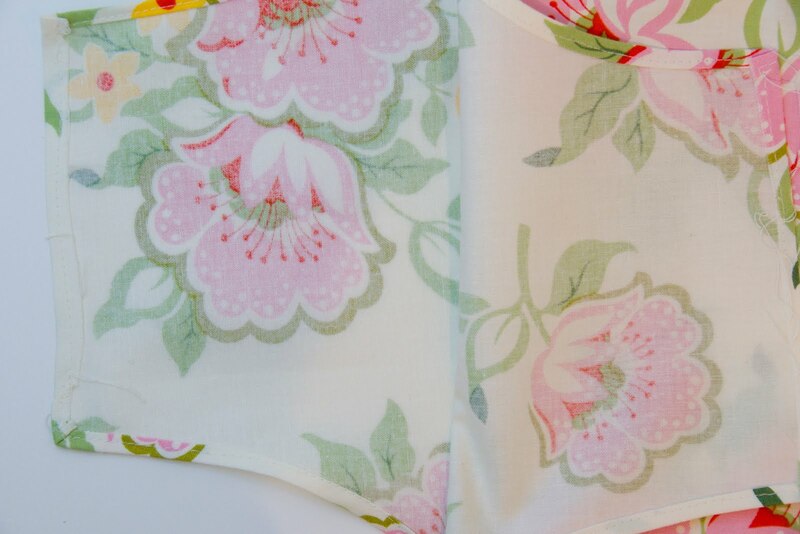 I haven’t sewed in a while, but I too love fat quarters because it takes the guess work out of finding the right fabric and gives me a pile that work. Are you ready for summer? We’ll be living at the pool, but I wouldnt’ have it any other way. Swim meets start on Wednesday. I love the more carefree days June and July offer. Sew cute!! 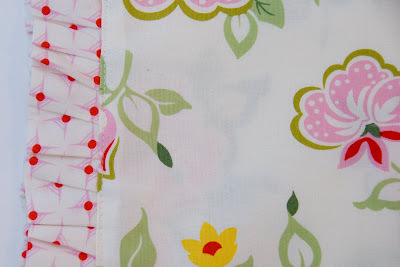 As for pillowcase dress tutorials… there is a free one at carolinafair.blogspot.com to make one from three fat quarters! 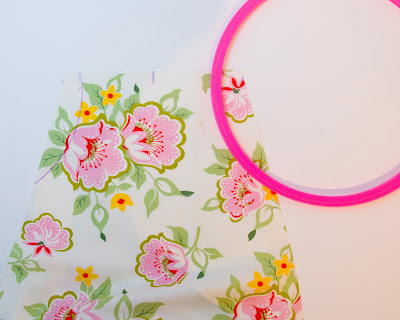 I have a really great pillowcase type dress tutorial that I can give you if you want one that has that polished look without the “woops I lost it” of the ribbon getting lost. Very cute! 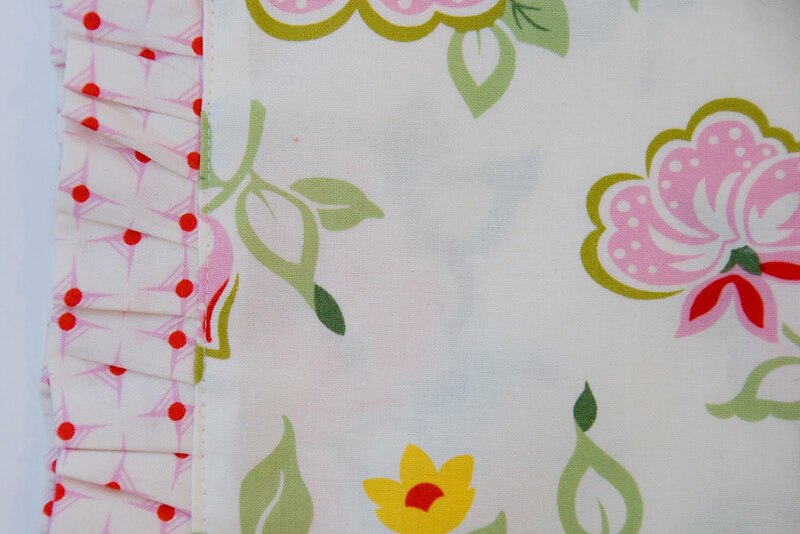 I love the fabrics and colors! I have a link party every Thursday if you are interested in linking up. 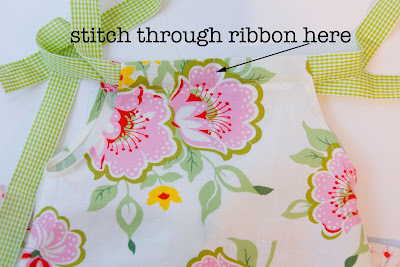 Have just linked to this tutorial after making a dress to your pattern…have used straps instead of the ribbon as my dress is for a newborn. Well done…lots of lovely things here! Can someone please tell me how to print these directions. 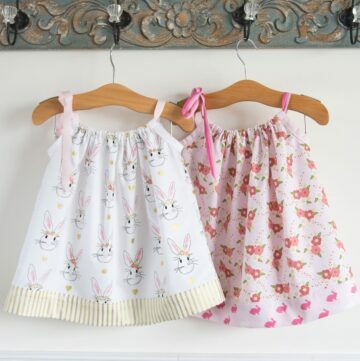 If you Google DRESS A GIRL you will see the patterns the organization uses for their pillowcase dresses. Perfect description you have provided thanks for sharing.